Ultrasound is often used to look for abnormalities in the breast tissue. This technology uses sound waves to generate images of the tissues. There is no radiation to the breast during an ultrasound examination. 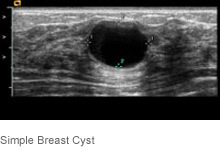 Ultrasound is particularly good at differentiating between solid and cystic nodules in the breast. It can also give the radiologist important information about the shape and size as well other characteristics of a breast lump. Use of ultrasound allows our physicians to avoid recommending unnecessary surgical procedures. When is an ultrasound exam done? Should I get an ultrasound instead of a mammogram? Peninsula Diagnostic Imaging has been recognized by the American College of Radiology (ACR) as a Center of Excellence for our digital mammography, breast ultrasound, and stereotactic and ultrasound guided biopsy services.